Home > September 2017 > Mutual Fund Investment - Using SWP - Systematic Withdrawal Plan for Monthly Cash Flow...! Mutual Fund Investment - Using SWP - Systematic Withdrawal Plan for Monthly Cash Flow...! For investors needing a monthly cash flow from their mutual fund corpus, systematic withdrawal plan (SWP) is a tool that helps them meet that requirement. It can be implemented in any open-ended mutual fund scheme. 1. How does SWP work? 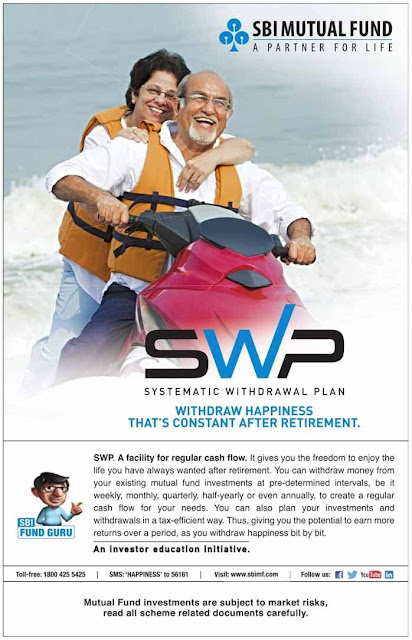 SWP is a facility through which investors can withdraw a fixed amount from a mutual fund scheme. The frequency of withdrawal could be monthly or quarterly . There is an option to customise the withdrawal you may with draw just a fixed amount or even opt to pull out just the gains on the investments. 2. How is SWP better than the dividend option? An SWP is more reliable than a dividend plan when it comes to regular income. In the dividend plan of an equity fund, both the quantum and frequency of dividend is not guaranteed, and it largely depends on market movements & the profits that the asset management company makes. 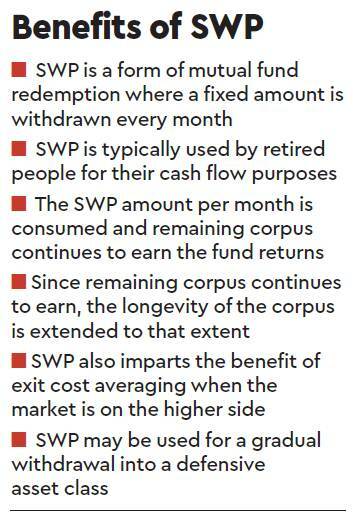 The tax treatment of each withdrawal under SWP will be the same as applicable to equity and debt funds. Hence, for units where the period of holding is less than 12 months for equity funds, investors will have to pay short-term capital gains tax. For debt funds, there will be a tax liability on holding for less than 36 months, and long-term capital gains on longer holding periods. In addition to this, investors also need to keep in mind the exit load of the scheme. 4. How do you start an SWP? An SWP can be started anytime. You can start it while investing in a fund. Also, you can activate the SWP option in a fund you already hold. For that, you need to simply fill out an instruction slip with the AMC stating the folio number, withdrawal frequency , date for the first withdrawal and the bank account to credit the proceeds.